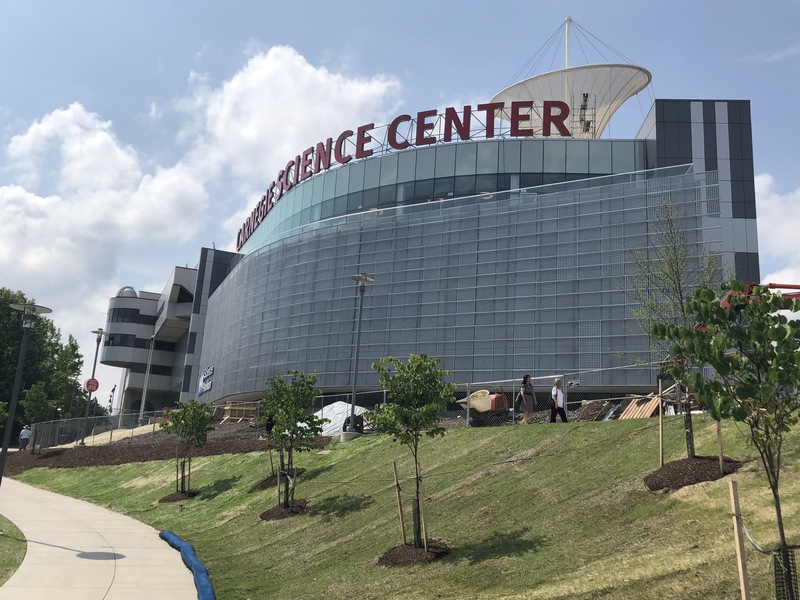 This Saturday, the Carnegie Science Center will open the 48,000-square-foot PPG Science Pavilion, which includes nine new STEM learning labs, a massive exhibit gallery, impressive new event and conference space and even a rain garden. 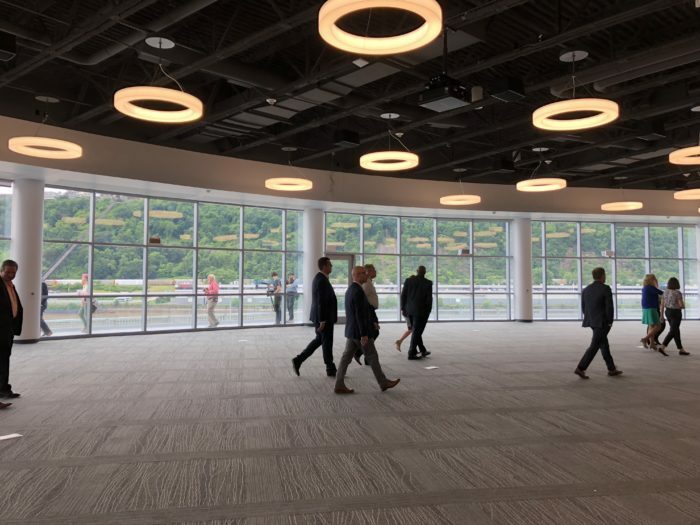 The new event and conference space overlooking the three rivers. Photo by Tracy Certo. The $33 million expansion has been nine years in the making, and the culmination of a fundraising effort that began in 2014. PPG and the PPG Foundation donated $7.5 million and more than 350 additional donors throughout the community contributed a total of $46 million. This is the biggest news to come out of the Science Center in the 27 years since it was established. “It’s really a historic moment,” said Ann Metzger, co-director, at the press conference today. The Carnegie Science Center is ready for the 40% expected increase in young learners it will serve. With 500,000 visitors per year, the Science Center is the number one destination in the city, she noted. With the new pavilion, they expect even more visitors along with a deeper commitment to education, workforce development and economic vitality. FedEx STEM Learning Labs, classrooms designed to expand the Science Center’s STEM programs, model best practices in STEM for preschoolers, and house camps and classes on topics such as coding, cybersecurity and river chemistry. The hope? That these new learning spaces will inspire young Pittsburghers to explore careers in STEM fields. 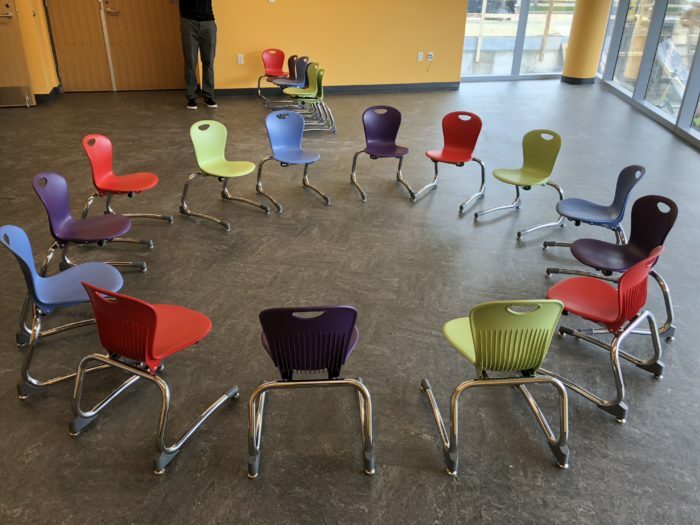 These nine learning labs will support a 40 percent increase in the number of young learners served at the Science Center. Also: the Scaife Exhibit Gallery, a 14,000-square-foot space available to host blockbuster touring exhibits that currently bypass Pittsburgh, and PointView Hall, a bright and modern conference and event space with knockout views of the city. The new pavilion space shown here opens up to the café. It’s next to a grand entrance by the river. Photo by Tracy Certo. In addition, as part of the PPG grant, they will have six mobile science programs traveling throughout the country, reaching hundreds of thousands of people. “We are preparing today’s students for tomorrow’s technology by energizing them around STEM — science, technology, engineering and math,” said PPG Chair and CEO Michael McGarry. That focus on tomorrow’s technology — and job force — is a vital aspect of the expansion: “It’s about bringing up an entire community,” said Mayor Bill Peduto. He added that in 10 years, Pittsburgh will be a different city with jobs we can’t even imagine today. The new PPG Pavilion at Carnegie Science Center. The project’s architect was Indovina, with work done by landscaper LaQuatra Bonci and Turner Construction. The Pavilion has been LEED Gold-certified for a healthier and more energy-efficient building. 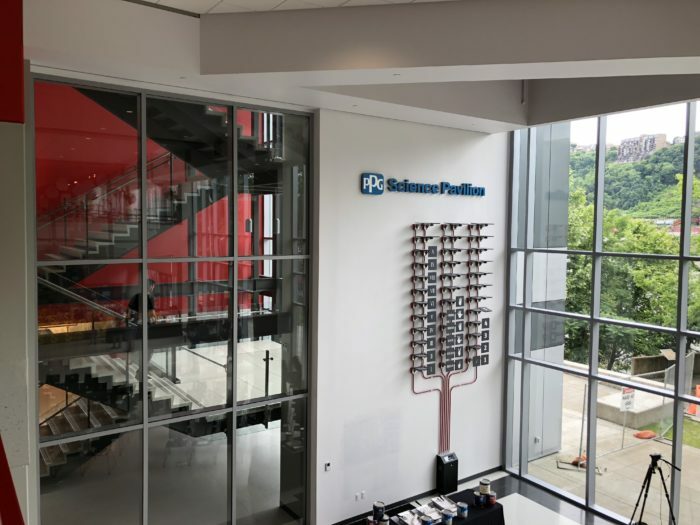 The post $33 million PPG Science Pavilion opens with cool labs, exhibit space and killer views appeared first on NEXTpittsburgh.